Whenever I attend the Television Critics Association press tour, be it the summer event in Beverly Hills or the winter event in Pasadena, I invariably walk away from the proceedings with at least one interview—but generally several—done in conjunction with a series I barely know the slightest thing about, save for whatever’s been put in the press releases sent out by the network. 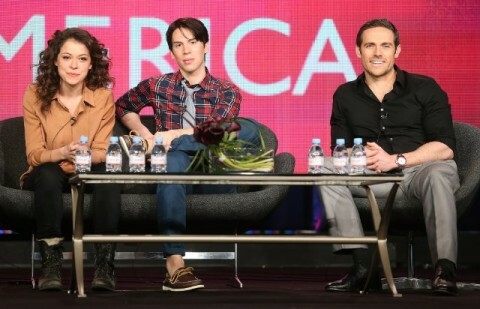 Fortunately, the young trio awaiting my arrival—Tatiana Maslany, Jordan Gavaris, and Dylan Bruce—had already been dealing with this problem with the interviewers who’d preceded me, as I was their last chat of the day. As such, they had a sense of humor about the situation…which worked out quite well, as I’d decided to throw caution to the wind and have a bit of a laugh about it myself. Jordan Gavaris: Ugh, I know. Tatiana Maslany: We haven’t even finished shooting the series yet! Dylan Bruce: How often does that happen to you guys? BE: It…happens. Maybe 10-20% of the time. It’s certainly not unheard of. TM: Okay, ‘cause when we’re done here, we go back to shooting Episode 7…no, wait, 6! TM: So we’re not even halfway through shooting yet!